Although France has banned religious symbols from schools, some of the country's 1,200 veiled Muslim schoolgirls are still searching for a compromise. "French education", declares a trim man behind a big desk, "aims to allow each person, irrespective of their religion or their community, the chance to start on an equal footing and receive the same education." This impassioned defence of French secularism comes from Raymond Scieux, headmaster of Lycee Eugene Delacroix in Drancy, a suburb northeast of Paris. For much of last year, Scieux and other French headmasters, had the unenviable task of guiding staff and students through a new French law banning all conspicuous religious symbols from state schools. The law is widely supported by the French, who regard secularism as a pillar of the Republic. No crucifixes, no skullcaps, no Islamic headscarves. There can now be nothing within the walls of a state school that can immediately identify a religious affiliation. From the beginning, the French law was perceived by most of France's five million Muslims to be an ill-concealed attempt to ban veils from the classroom. 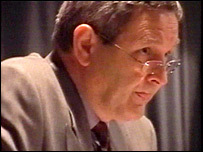 "There's a lot of tension in the Islamic community which feels targeted," Scieux admits, "but it's actually applicable to all religions". Between May and October of last year, the BBC filmed at Lycee Eugene Delacroix with people from both sides of the debate. Teachers, their headmaster and pupils were caught up in an emotional drama that would ultimately decide whether or not a handful of veiled girls would be expelled for wearing the Islamic headscarf in school. "What does this veil mean to me?" asks Touria, a softly-spoken and serious pupil at Delacroix. "It's part of who I am. It's not just some bit of fabric on my head. It's everything. "Looking back on it, I can't imagine taking it off. What I'm wearing today I consider the minimum." 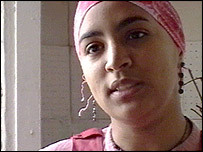 What Touria is wearing is a bandanna, a simple scarf that covers her hair but not her ears or neck. She says she prefers to wear this so she doesn't draw attention to herself or her religion. Touria is one of five veiled girls from Delacroix who are meeting once a week in a friend's flat to discuss their strategy to fight a strict interpretation of the law at their school. Others come to the meetings too, including a handful of anti-law teachers and non-Muslim schoolfriends. Their fear is that the headmaster will decide to ban all headcoverings, so they're looking for a compromise. The headmaster, however, is under pressure from the majority of his teachers, who want a total ban on headcoverings. He has decided to hold a public meeting at the school term so all interested parties can air their views. Among the speakers at the public meeting is Eric Finot, a history teacher at Delacroix with strong views on the subject. As he rises to speak, he says he wants to address the veiled girls in particular. "We are only asking you to abide by the principle of secularism," he says. To the anger of the girls, he then adds: "We are thinking of those girls who we could maybe protect a little bit at school... This law is here to protect those girls who are compelled to do things they don't want to do - not to be forced into marriage, not to wear the veil." 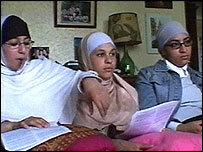 For the veiled girls, the public meeting confirmed their worst fears. The pro-law lobby was mixing everything Islamic in the same pot: Sharia law, forced marriage, veils. They understood very well the feminist arguments condemning many aspects of their faith, but all of them insisted that they were under no pressure at home to wear the veil. In fact, quite the opposite. Their parents would prefer to them to de-veil than jeopardise their education. Touria adds: "People say that it's the women who wear the veil that are submissive... but I think it is those women who are submissive, because it is what men want, women half naked." As the veiled girls agonised over whether or not they would de-veil, their headmaster became convinced that a compromise was possible. When Lycee Eugene Delacroix opened for the new school year, it was one of the only schools in France to allow girls to wear a discreet bandanna. 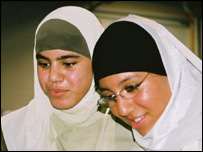 But for veiled girls like Iptiseim, this was not the outcome she had hoped for. "Now that I'm wearing a bandanna in school," she says, "when I come out I can't wait to put my veil back on. It was always important, but now even more so." The Headmaster and the Headscarves was broadcast in the UK on Tuesday, 29 March, 2005 at 2100 BST on BBC Two.